Well, I’ve pretty much done it. 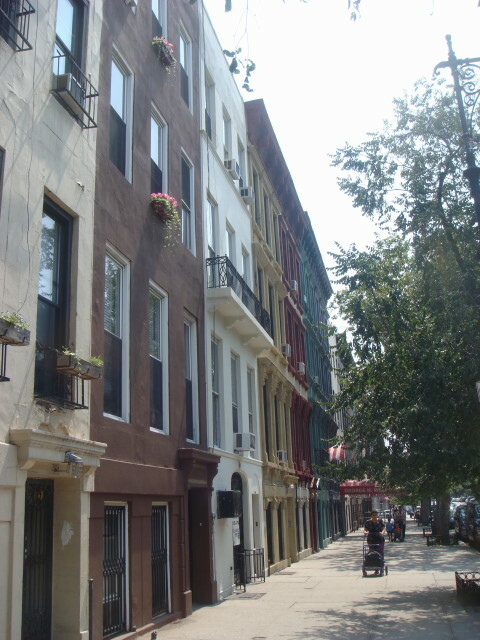 The one large area of Manhattan that I hadn’t explored to some degree was Spanish Harlem. I’ve been past it and I wandered through a small section right after I moved to NYC, but I hadn’t really explored. And now I have. That isn’t saying I’ve been everywhere; there are huge areas that I haven’t seen and zillions of small streets I haven’t been up and down. But, I don’t know of any “name” area I haven’t at least visited. Of course, it’s all in my own definition; some areas that I just consider parts of some neighborhood may be very distinct and reject the association. But for my own sense of smug satisfaction; I’ve been everywhere. But I’ll admit that I only did a tiny section of Spanish Harlem. 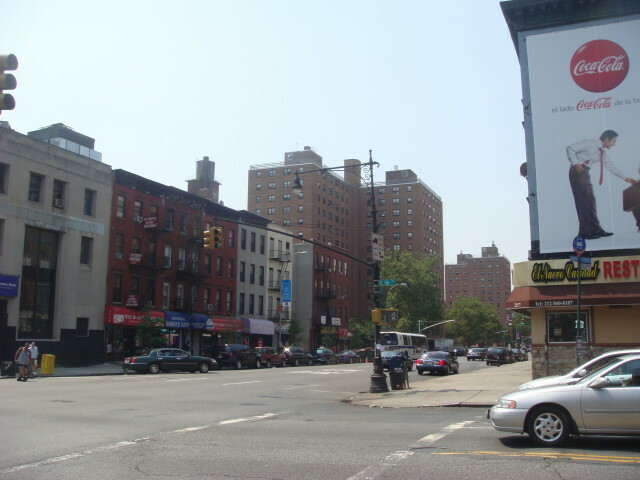 Harlem is huge. Gigantic, even, at least by the way that NYC looks at it. Spanish Harlem, like every place else, has multiple names. 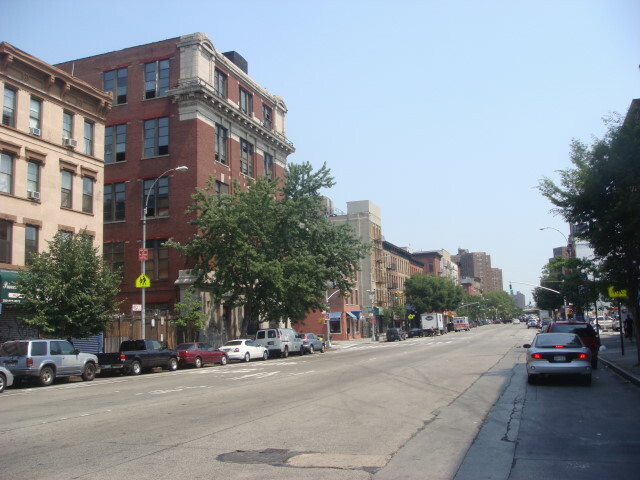 Lots of folks call it East Harlem. But I like the sound of Spanish Harlem and I’ll keep calling it that. 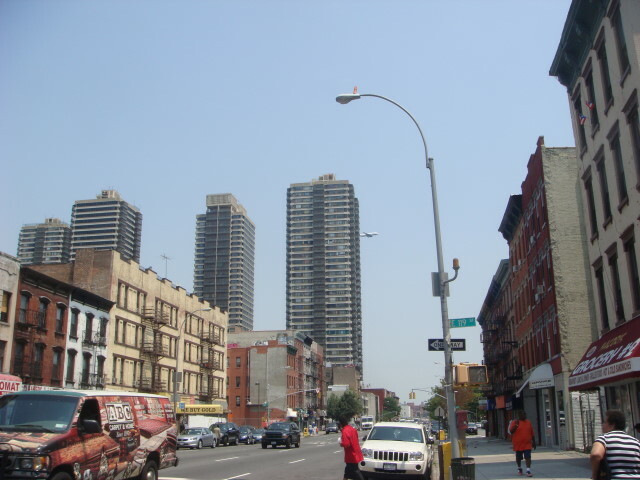 When I wandered, my main steet of interest was 116th Street between 3rd Avenue and FDR. It’s the main business district area (at least east-west) from what I understand. Lots of little stores, but there are quite a few chain store places coming in. But the below picture is just one of those shots that captures a lot of the flavor of the place. Perhaps a little more flattering than the rest really is, but there were parts that I liked. But a lot of the area is just like the below. Ordinary. A bit run down, but not romantically so. I wandered around for a while. What I was looking for was an area a bit like regular Harlem. That area, as I’ve mentioned a number of times, may be run down; but the architecture is often magnificent. The picture below doesn’t capture anything “magnificent”. Just moderate to okay. There were two areas that did capture my attention. One of them below was pretty nice. Not perfect, but pretty nice and colorful. They lacked the stoops that would differentiate them from blah to wonderful. Stoops are good. But mostly, it was just like the next picture. A place to live, but not really a place to visit. I had wanted much more. About the only thing that I liked about the area was the lack of traffic. The streets were nice and wide, too. The next picture shows another of the better areas. It certainly needed fixing, but it had the makings of a nice place if you threw enough money at it. 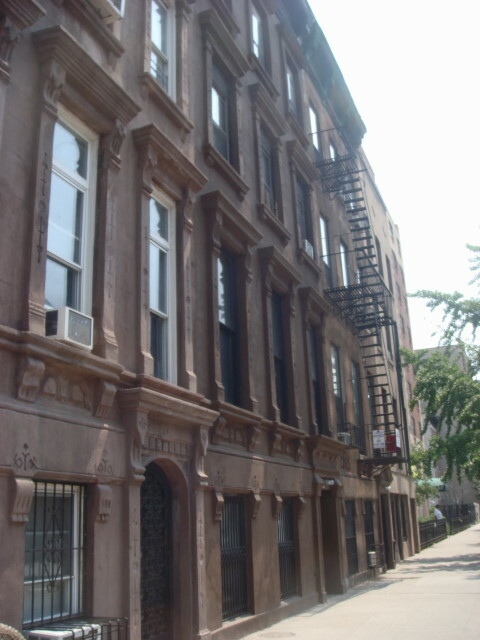 These really started to look like brownstones; but still, no stoops. Once again, here’s a picture of wide, open, and empty streets. It was noonish on a Saturday. I know gas is expensive (I read the news and am happily car-less), but there oughta be somebody out. 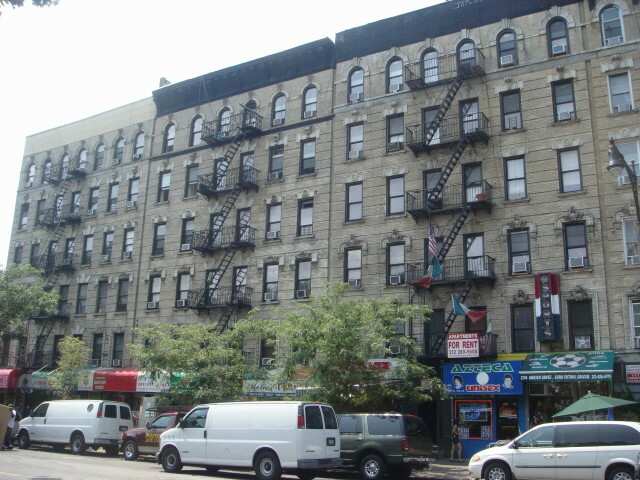 Okay, below is my last picture of this part of Spanish Harlem. Taken over on 2nd Avenue near 120th Street. What’s interesting about this? Nothing for anyone else; but for me it was different. Or at least had something that I don’t often see. Take a look at the tall building in the center. About 80 percent up on the right side…is an airplane. Just heading to land at LaGuardia. But I so seldom see airplanes that I was absurdly pleased. Heck, sometimes it seems that I seldom see sky. 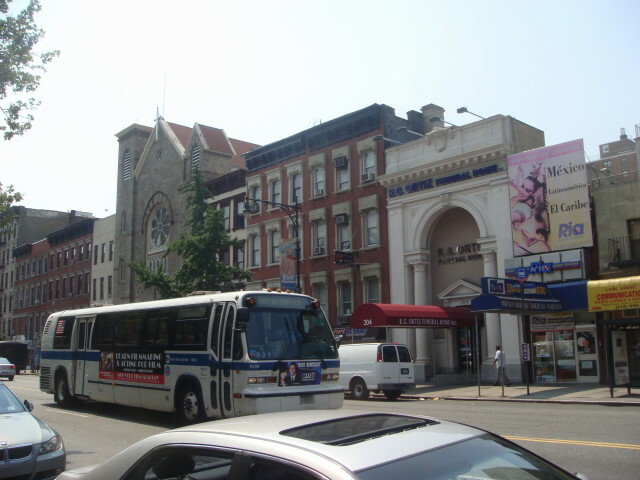 This entry was posted on July 15, 2008 at 6:47 pm and is filed under Harlem, Manhattan, Wanderings. You can subscribe via RSS 2.0 feed to this post's comments. You can comment below, or link to this permanent URL from your own site. 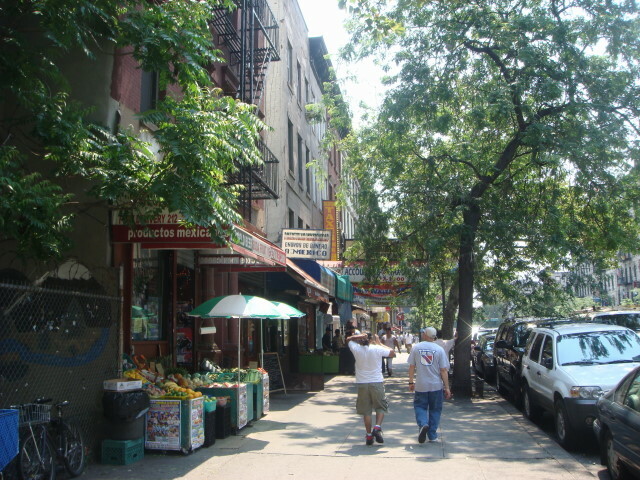 Spanish Harlem’s magic lies more in its culture than in its architecture– the people, the music and the food. Next time you are in El Barrio you should check out Ricardos and Mojitos for great food and drinks. Check El Museo del Barrio for wonderful art and go to the Harlem Mear on Saturdays for fantastic salsa. I think I passed right by Mojitos (perhaps it is in the second picture above?). But I can’t find a reference to Ricardos. Mexican food (okay, I’ll admit it: actually Tex-Mex) is my favorite. I’ll check out Mojitos soon. Thanks for the recommendation. With regard to the culture, you’ll note one issue I raised was the lack of people around that day. I found that very odd. I did find a bunch of people in Thomas Jefferson Park just to the south; but even it wasn’t jam-packed. 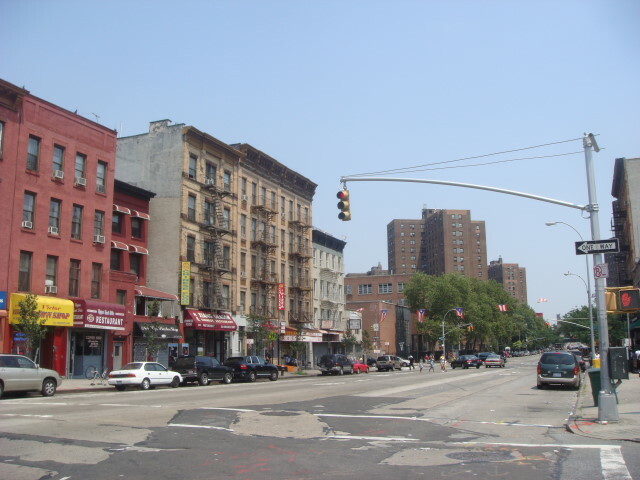 So, yes, my experience in Spanish Harlem wasn’t the one that I expected. But that’s reason to go back.